The Pro RC Series Ritchey Chrétien telescopes made by Officina Stellare are built around the best quality optics available today. All optical sets are created under precise quality requirement conditions, using the highest materials and production processes. Each optical set comes with its own interferometry report stating and certifying the overall quality to the customer. In the making of the optics, Officina Stellare only uses blanks of certified origin and perfect homogeneity, and are optimized further with the application of high reflectivity, multi layer anti-reflection coatings. Officina Stellare verifies each and every one of their instruments before delivery to the final user. 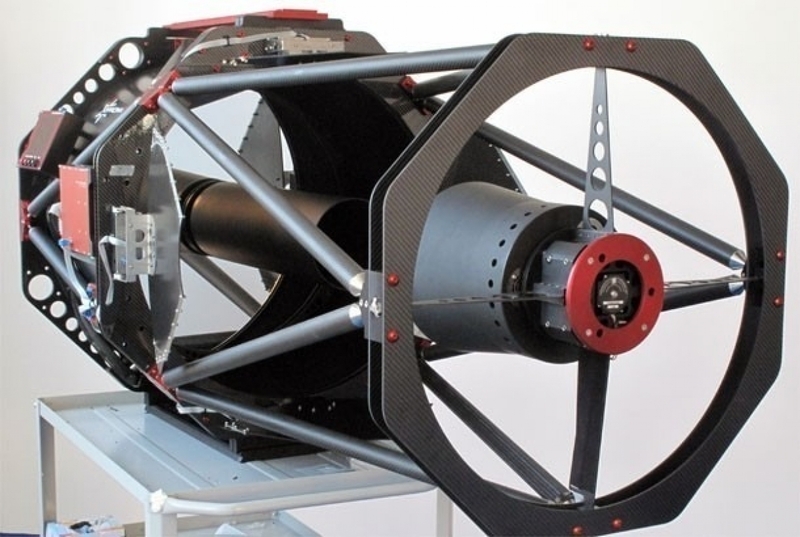 Officina Stellare uses carbon fiber in their premium quality RC telescopes because of its lightness as well as its mechanical and thermal properties and for carbon fiber's optimal resistance to environmental conditions. The full carbon open truss tube assembly is very popular due to its stability of focus throughout the night. Combine these features with the superb quality ceramic optics of this system and you get near zero thermal expansion, guaranteeing the most stable focus possible. All the mechanical parts for the the OTA are machined using CNC computer assisted machines to guarantee the best possible precision. The carbon fiber components are produced following strict specifications and tolerances. Each part has been computer designed and optimized for the best structural performance, rigidity and lightness. The holding systems for both mirrors, the spider, rings and all the structural components, even the smallest, are CNC machined from a single block of special aluminum (6061/7075, Ergal and Anticorodal), stainless steel, titanium or brass. The tubes are made of true carbon-graphite fiber obtained with the use of a high vacuum process, allowing Officina to obtain the best stability of focus vs temperature changes while still maintaining the best structural rigidity and lightness. Great care is taken in the making of the rear cell of the primary mirror. The design was created so that the cell would not introduce any astigmatism, mirror flop or shift in the system. The primary mirror is fixed in a multi-point cell of innovative design that holds it linearly in the center and radially on the borders in order to distribute the weights, for any given position, in an optimal way. An extra reinforcement plate is added in the back of the mirror and holding points are increased (up to 27! ), and are optimally distributed using computer based optimization methods. This extra care increases the stability of the entire system. The convection and thermal irradiation are greatly improved with the use of three high quality axial fans in the back of the cell. Great attention has been applied to simplify the collimation between the mirrors, resulting in a stable, efficient but easy to use system. The collimation is accomplished by acting on just three points (the minimum required points to generate a single plane) using special, large diameter preloaded bolts (one for each point). This results in being able to use just one hand; simply turn the bolt left or right to move the mirror back and forth (no more complicated operations using push pull screws and locks) in a very intuitive way. Finding the correct positions is a snap. The mirror borders use an opaque, circular mask to avoid any undesired light scattering. The light shields for the primary and secondary mirrors are computer designed and optimized to ensure complete illumination of the field while still maintaining complete protection from stray light. The back plate of Officina Stellare PRC telescopes come standard with a system for adjusting the planarity of the focal plane in order to compensate for any small misalignment in the imaging train, always unwanted and annoying, especially with today’s large CCD cameras.